Kevin comes to us as a stray from MDAS. He is a brindle male weighing approximately 42 pounds. He had multiple wounds and lacerations on his face and by the side of his eye; we are not exactly sure what the source or cause of the trauma was. It looked like his wounds were superficial and healing, but over the last few days, he was unable to open his left eye fully, and clearly has been in a lot of pain. We took him to our vet and upon further testing, noted he had very elevated pressures in his eye. We brought him to Animal Eye Specialty Clinic in West Palm Beach and they discovered he had severe trauma to the left eye. For his comfort, we had to remove the eye, unfortunately it could not be saved. The surgery cost approximately $1500, and we have started a YouCaring page to help with his vet bills. He had the surgery on Thursday, May 4 and stayed overnight at the vet. He is currently back with his foster family and is recovering. He is a true bull terrier, a warrior, and we have all faith that he will recover and adjust to life as a one-eyed pirate bullie. From what we were able to observe prior to his surgery, he seems to be playful and energetic and can get a little rough with play. He is very sweet and knows basic commands. He has no food aggression. He pulls on the lead but will stop with control. He also loves going on car rides. He appears to be dog-selective. He was kid tested and appeared to be friendly with no incidents. He has not been cat-tested yet. He is neutered, microchipped and up to date on his shots. 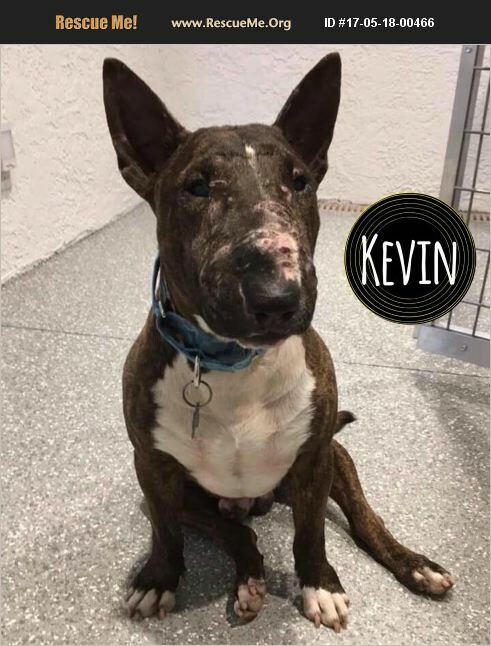 If you are interested in fostering, fostering to adopt or adopting Kevin, please apply online now!